Spencer Platt/Getty ImagesColumbia University is in New York City. The Wall Street Journal collected data from 445 prominent universities to track where alums move after graduation. Business Insider looked at where Ivy League graduates move after earning their degrees and for the most part, they all move to the same places. New York City was the No. 1 destination for graduates of all but two Ivy League schools. What you study in college may not always determine what career you have, but the school you attend seems to impact where you live after graduating. The Wall Street Journal collected data from 445 prominent research, NCAA Division I, and liberal arts universities outlining where alums live after graduation and ranked the top four destinations for alumni of each college. Business Insider looked at where Ivy League graduates move after earning their degrees and for the most part, they all move to the same places. 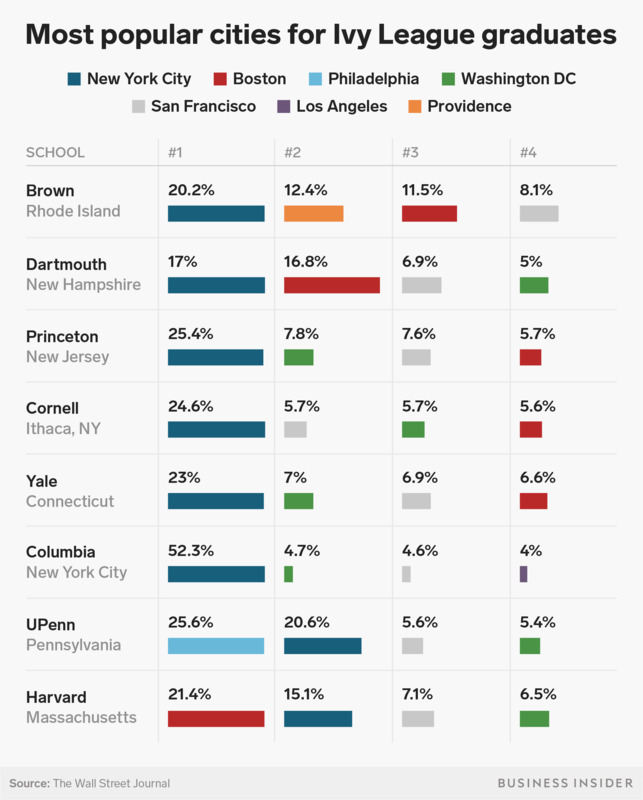 Among the eight Ivy League schools, New York City, San Francisco, Washington DC, and Boston are the most popular. New York City was the No. 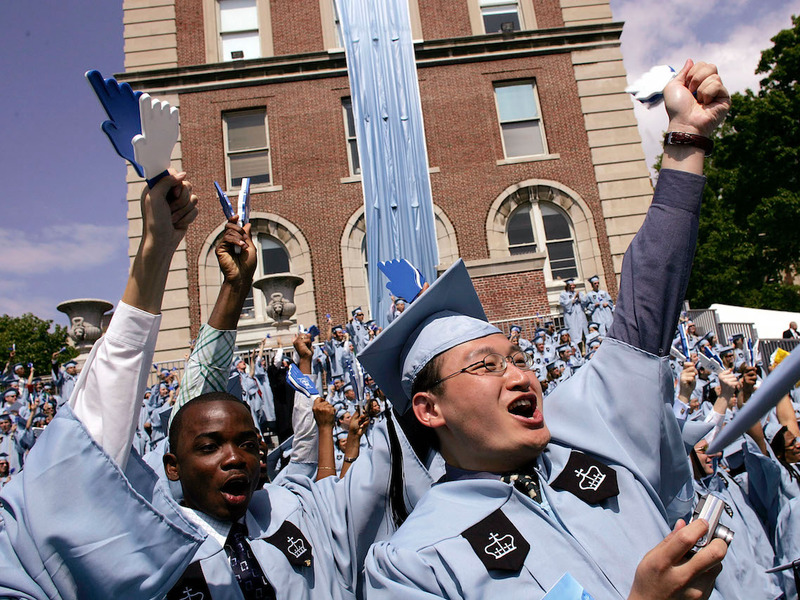 1 destination for graduates of all but two Ivy League schools, with at least 17% of alumni moving there, or in the case of New York’s Columbia University, staying there after graduation. New York City is a popular destination for Ivy Leaguers who graduated from schools lining the East Coast. New York City is more affordable than you think with loads of free entertainment and big businesses, Business Insider previously reported. 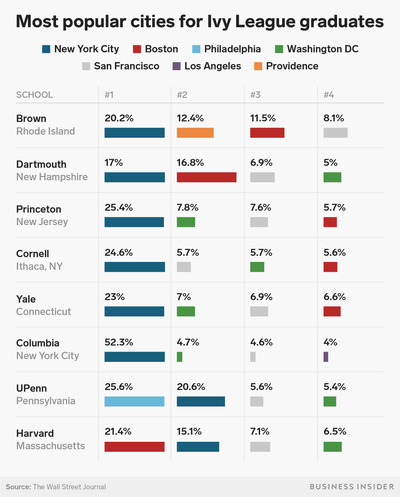 Meanwhile, about one-fifth of grads of Harvard University prefer Boston and one-fourth of University of Pennsylvania grads stay in Philadelphia.